The High Jarl sent out a group of brave Vikings to seek new lands. They discovered group of islands that are rich of natural resources and The High Jarl gives them the task to gain control of these resources. There is a minor setback, the islands are currently occupied by Barbarian tribes. The takeover is to be done in any way possible; through trade, religious conversion or direct conflict. If you manage to overtake areas peacefully, the Barbarians might join your clan and aid you in your task. 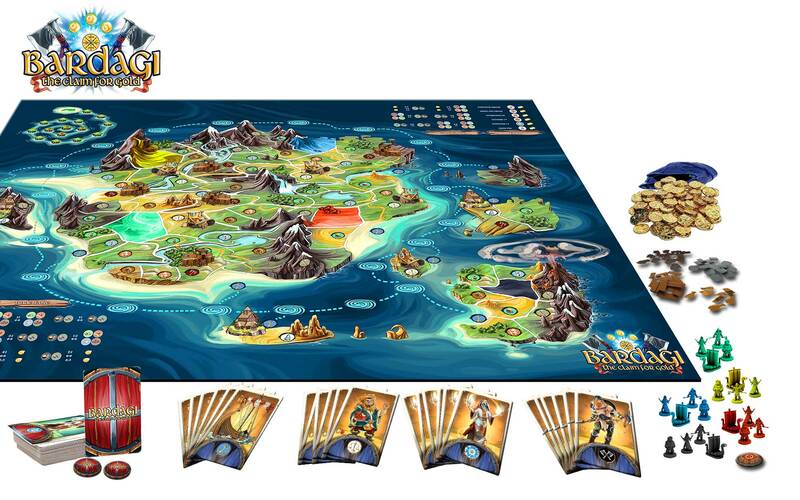 During the game, your clan tries to build up their region and over shine their rivals with vast riches and wealth. Upgrade your buildings to improve your charachters or gain more resourecs. There are areas through the island that stand neutral against any invaders and there you can buy or sell resources & learn runes that you can cast. At the game end, the winner is the Clan Leader who collects the most gold! 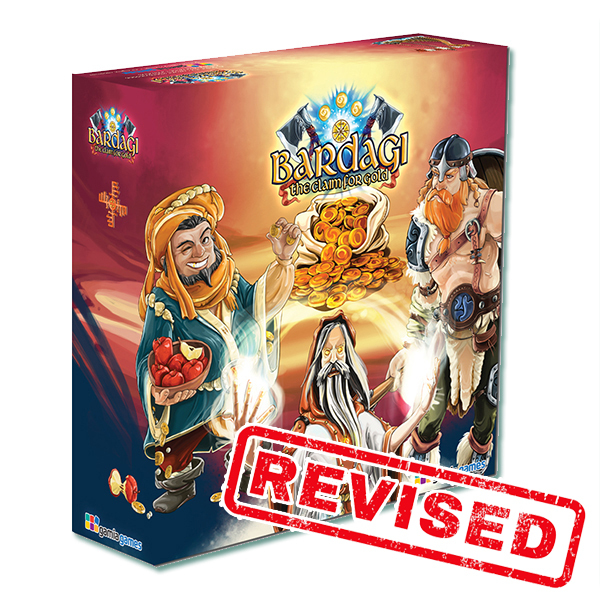 Bardagi: The Claim for Gold is a card-driven, area management, adventure board game for 2-5 players, played in a number of rounds and each round is divided into 4 turn phases. 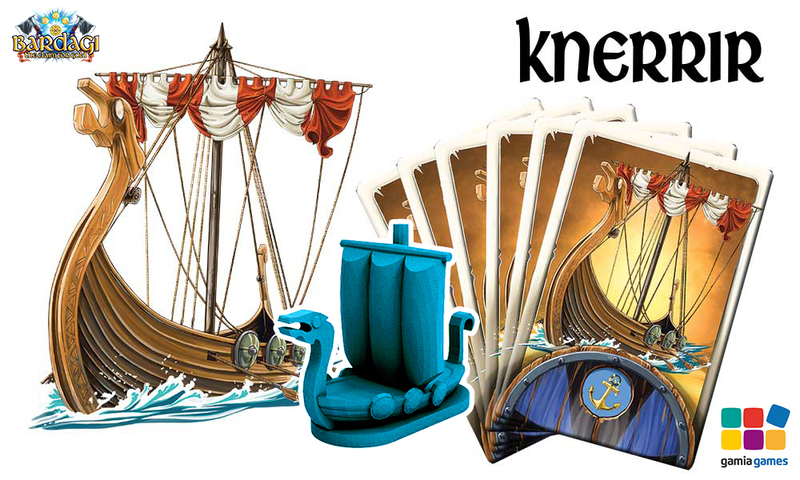 Each player controls a group of Vikings; a Berserkur (your warrior), a Godi (your priest), a Kaupmadur (your merchant) and Knerrir (your Viking ship). These units are used to claim and overtake areas from the Barbarian tribes currently occupying the land. Players start at their home town, represented and managed by your player board. During the game, players overtake the areas surrounding their town to gain resources. Players gain resources each round, according to the areas owned, and with these resources they can reload the units, that are needed to overtake other areas, buy upgrades to improve their buildings, buy runes or trade resources in for gold. Occasionally, a direct conflict with you rivals might be beneficial for your clan! The aim of the game is to collect the most glory points within the given rounds to be declare the winner at game end. 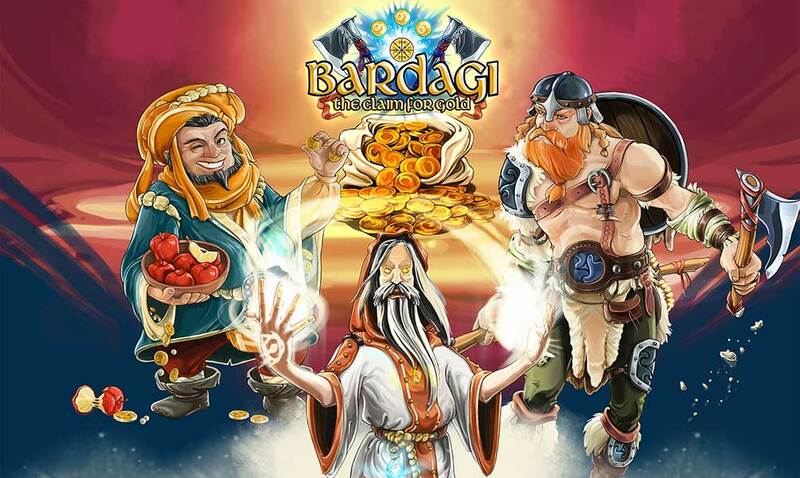 Bardagi – The claim for gold has two maps, Summer themed map (for 2 – 5 players) and Winter themed map (for 2 – 3 players). 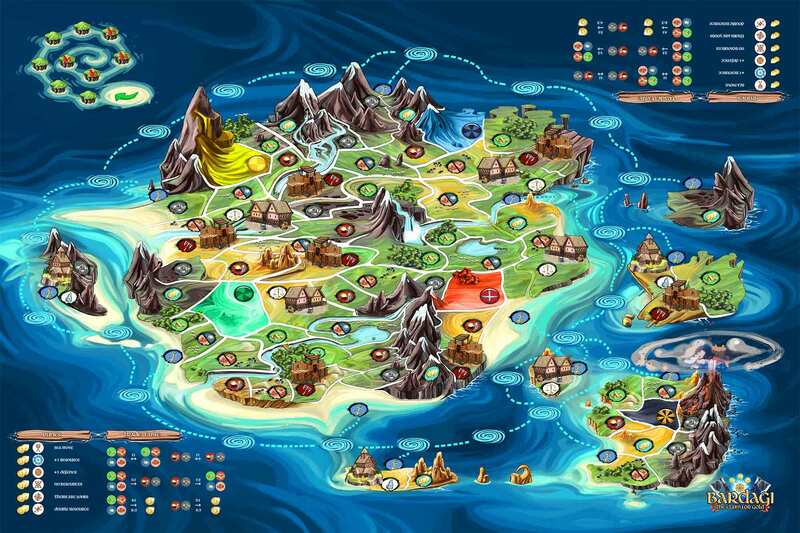 The main Summer map shows one main island and a few smaller islands in the surrounding area. On the board you can also see trade tables and round counter spiral. Areas on the board are divided into different resource areas; gold mines (that yield gold coins), forest (that yields timber), quarries (that yield stones), iron mines (that yield iron), sheep pastures (that yield meat or wool) and cattle pastures (that yield hide or food). The map also displays your town as an area in your color, harbors, where your Knerrir starts and ends his sea journeys, raiders camps, that can be conquered to gain additional defense, sacred locations, where you can buy runes that can aid you and local villages that you can claim to gain new units for free each round. Some areas on the map are harder to reach than others due to impassable mountains, rivers (that can only be passed over bridges) or islands that can only be reached by sea. 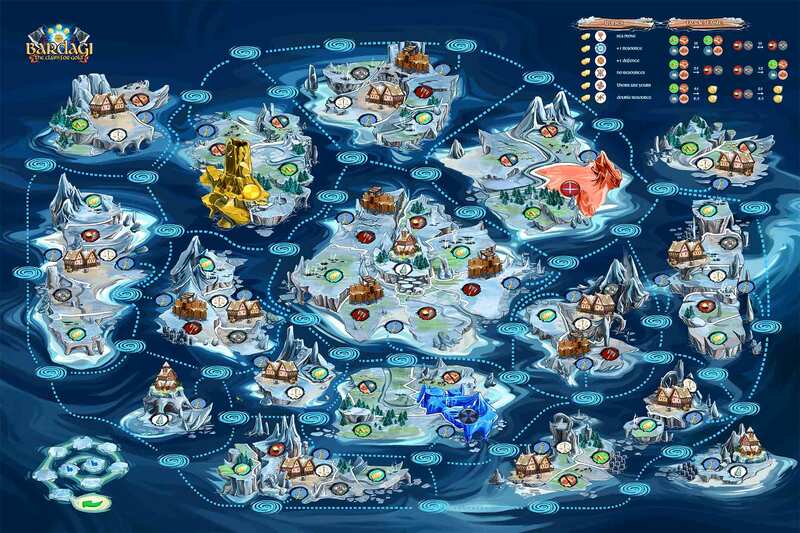 The Winter themed map have more islands and players must use their Knerrir (Vikings ship) to reach locations that have the more valuable resources, iron, stone and gold. The center island is rich of resources and with the sacred location temple in the center it is often the vital conflict area, but then again you might just let the other two clans spill their blood there while you roam freely in other islands of the map. Or you might just use the opportunity and overtake the areas surrounding their homes. Decisions, decisions. The player board represent your home area on the Main board, the area marked in your color. 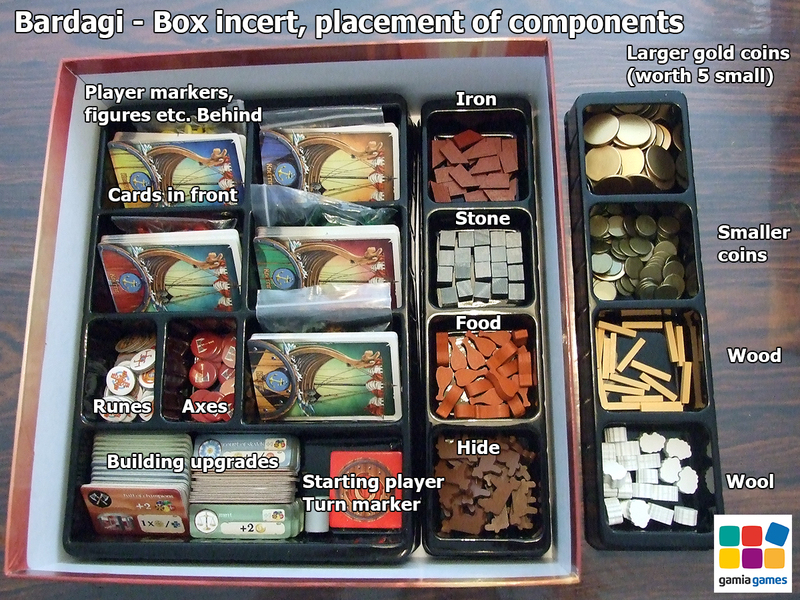 This is where you manage your units, store your goods and gain or loose your glory points during the game. On the top of the player board there is your storage, where you store your gained goods in their corresponding storage box. Below the storage boxes, you have the glory point track surrounding the town management area. 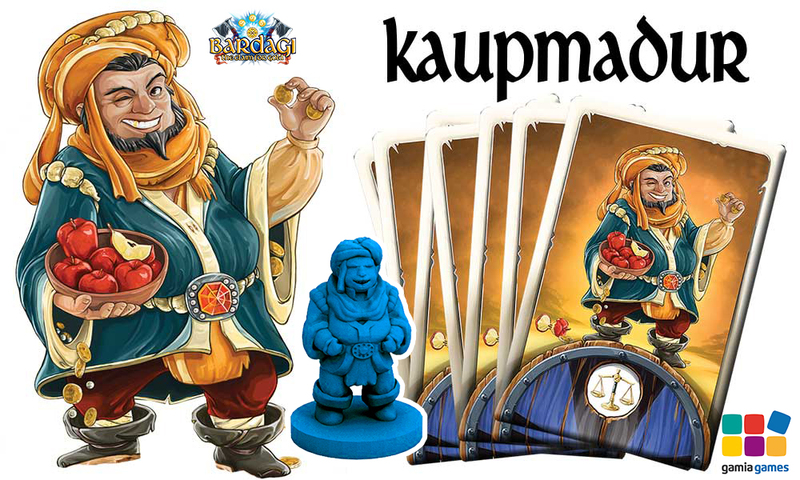 With your gained resources the Kaupmadur (Merchant) can buy building upgrades at his home town. The building upgrades gives the player glory points when purchased and a permanent improvement. The improvement gained can be related to one of the 4 units, increased number of gold or goods gained each round or extra glory points for specific area types owned each round. 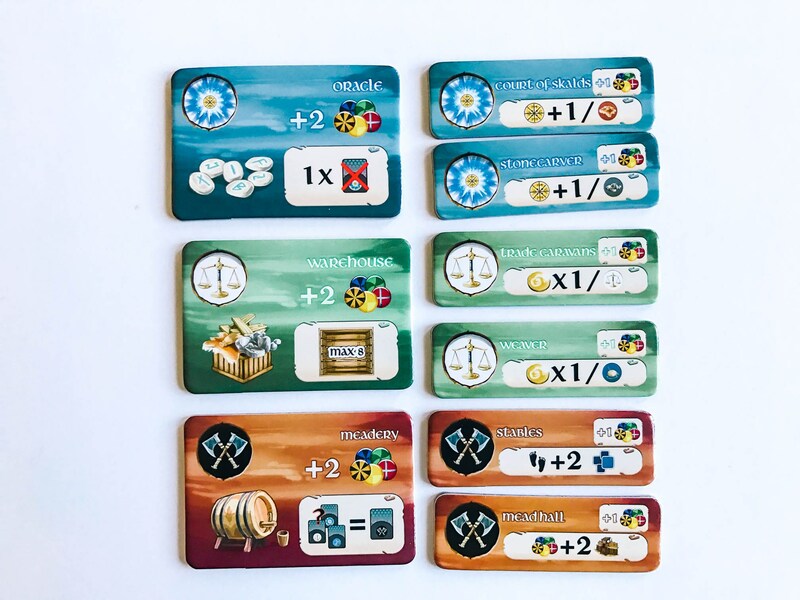 Each player has four units they control during the game. To control an action of each unit, players use the corresponding cards. Players choose in secret the 6 cards they aim to use in the upcoming turn before the turn begins. Each card chosen represents one action of the chosen unit. The cards players aim to use can be a combination of one or all of the units. Cards chosen at the beginning are the cards players can use this turn, so therefore an unexpected move by an opponent might make the chosen hand less valuable. 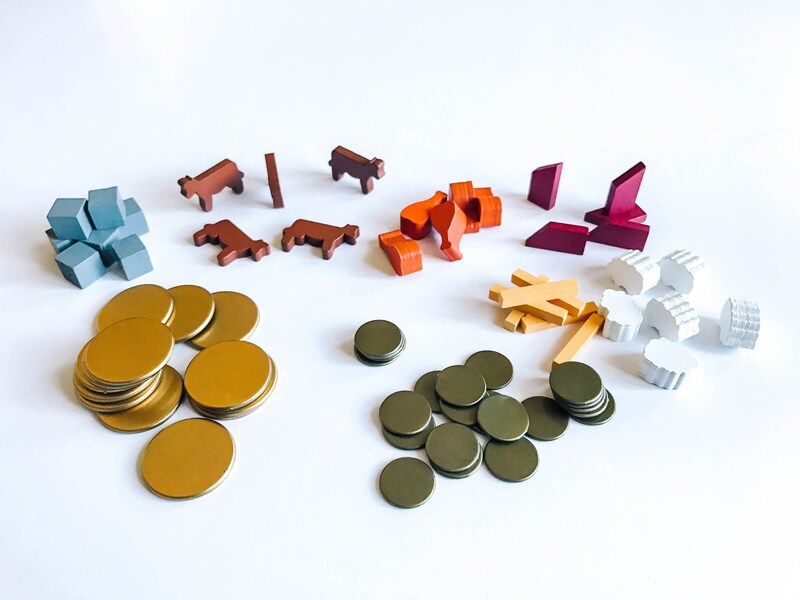 There is a number of wooden reource tokens that players collect furing the game, along with coins. These resources are used during the game to manage the clan in order to Claim the Gold! ” I really like the art style in this one. The central island map that you’ll be fighting over is gorgeous. 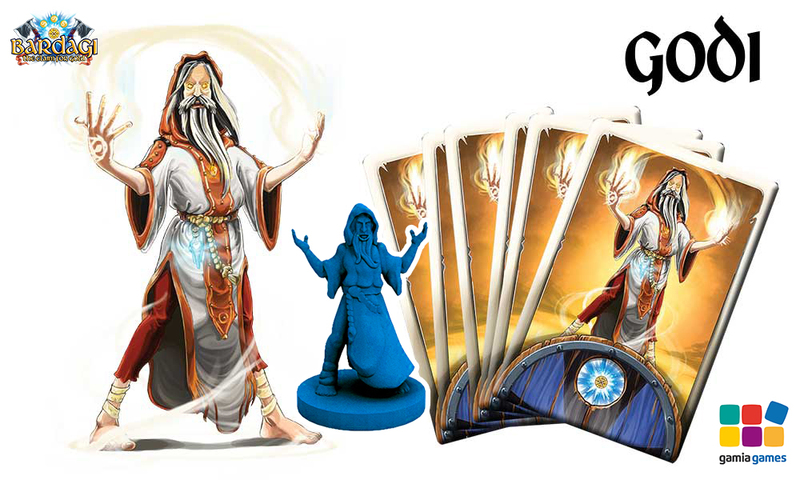 Check it out.” – Mike Minutillo, BGG – Kickstarter Weekly summary blog. “A gorgeous game !! Fantastic artwork, beautiful miniatures, a Viking theme that I love, …Really need to check this out !!! 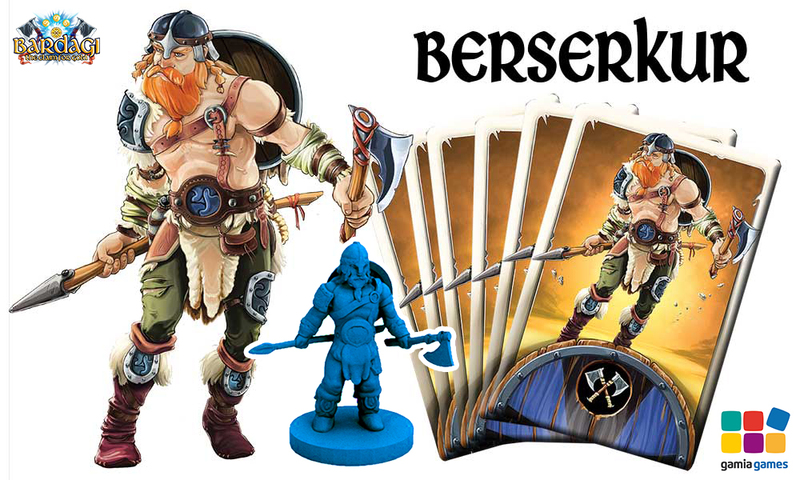 !” – Dirk Rieberghs, BGG – Stresses for Essen geek list.